De Menil and her associates had flown to Munich, expecting to see two Byzantine frescoes of unusual excellence. Their contact, Turkish businessman Aydin Dikmen, led the little party to a ratty neighborhood at the edge of Munich, then up a flight of stairs to an apartment that had no electricity. In a room lit only by two candles, de Menil was shown two pieces of plaster (John the Baptist, plus part of an angel) propped against a wall. Other bits were packed in a crate. De Menil was horrified. “The pieces were too much chopped up to derive any impression of beauty,” she later told Texas Monthly reporter Helen Thorpe. 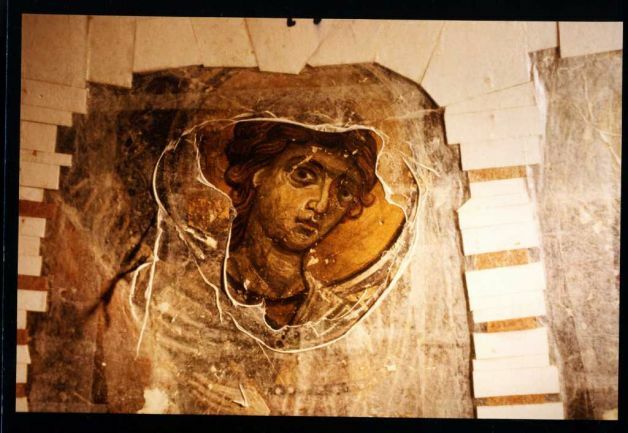 “It was like a miserable human being that has to be brought to the hospital.” Through translators, Dikmen told her that the frescoes had been discovered under rubble at a construction site in Turkey. The de Menil party doubted the story. But de Menil agreed to pay Dikmen earnest money in exchange for the right to buy them in the future. At that point, she did something unusual for the wild-and-woolly 1980s antiquity market: She began earnestly trying to track down the frescoes’ rightful owner. Eventually, after many letters exchanged by lawyers and embassies, it became clear that the frescoes had been stolen from a tiny church near the town of Lysi, on the island of Cyprus. In 1974, after Turkey invaded northern Cyprus, looters systematically robbed the area’s churches and monuments of anything they could carry off. In the little church at Lysi, where the frescoes were painted into the walls’ plaster, they’d glued cloth to the walls’ surfaces, then used a chain saw and chisel to hack away Christ, Mary and the angels, yielding 38 cloth-fronted pieces. It is a fascinating story of one of the rare examples of a collector working with the original owner to solve a theft, restore the mosaics, display them, and return them to Cyprus. But in this case, the thieves were rewarded. The mosaics were stripped from their church, sold on the international market in Munich. 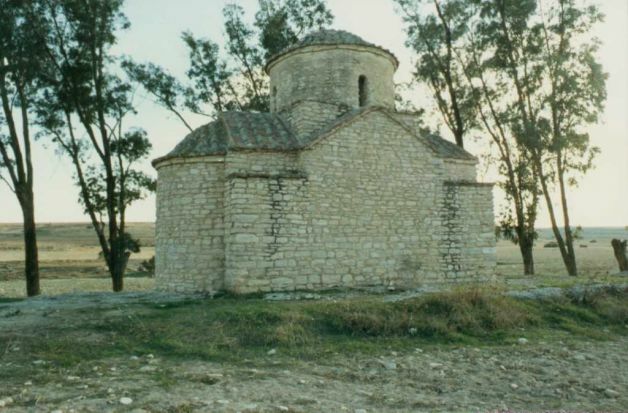 So it is a good result, and the Menil and the Byzantine Church of Cyprus should be rewarded, and yet this was a success for the thieves as well. Lisa Gray, Afterlife for a chapel, Houston Chronicle, February 5, 2012, http://www.chron.com/life/gray/article/Gray-Afterlife-for-a-chapel-2968817.php#src=fb (last visited Feb 6, 2012). Earlier this month a church in Larvik, Norway was robbed of a work by Lucas Cranach, Let the Children Come to Me. The work was soon recovered, and will be displayed again later this summer after it is restored. This work, Suffer the Little Children Come Unto Me by Lucas Cranach the Elder was stolen from a Lutheran church in Larvik Norway police announced on Sunday. They discovered the theft after responding to an alarm early on Sunday morning. It seems one or more thieves climed a ladder, broke a window, and took the work. The painting on wood panels had hung in the Church since its construction in 1677. 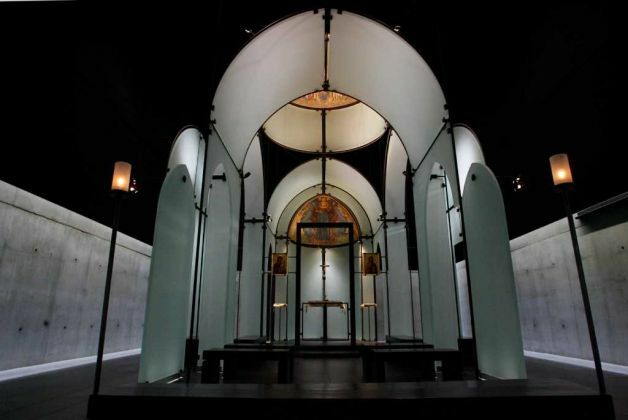 Thieves stole more than 20 religious objects dating back to the 17th century from a cathedral in the southwestern French city of Perpignan, the Culture Ministry said. Culture Minister Christine Albanel was visiting the Saint Jean the Baptist cathedral in Perpignan, as well as meeting police and regional cultural officials, on Thursday to express her outrage at the theft, the ministry said. More than 20 pieces dating from the 17th, 18th and 19th centuries, including plates and chalices for Communion, were taken overnight Tuesday, the ministry said. Stephane Brunelle, a spokesman for Roman Catholic authorities in Perpignan, said the thieves took the most valuable items. Though beer cans were strewn on the floor, investigators suspect that may have been an attempt to confuse police and make the crime look like vandalism rather than a well-organized plot, he said. Albanel, during her visit to the cathedral, said she would push for tougher sentencing for those who burglarize historic buildings. Churches are vulnerable. I’m not sure increased criminal penalties will prevent this problem, but it can’t hurt I suppose. Increased security and stricter provenance checks are the answer. I am often amazed at the valuable works hanging in Europe’s out-of-the way churches. Four works by Lucas Cranach the Elder have been discovered at a German antique dealership 27 years after they were stolen from a Lutheran church in Klieken in East Germany. The thieves were never caught. Art experts have said that only a handful of experts would have been able to recognize the works as Cranach’s work. This highlights again the problem of two innocents. What the brief wire reports do not say is that the antique dealer probably has superior title to the works. I’m not too familiar with German art law per se, but in most Civil law systems a good faith purchaser will have superior title to the original owner. The dealer has not done anything wrong, and neither has the Church which was victimized. As a result legal systems have a difficult time allocating rights between the two relative innocents. Once again its a reason why databases such as the Art Loss Register should be consulted every time a work of art of any kind of value is purchased. There is no indication whether the dealer consulted any art loss databases, but he should have. Provenance research is the cornerstone of a licit art market, and the best practical way to prevent art theft.